I've done a lot of yoga themed posts over the years, and have shared everything from my favorite yoga clothes to the classes I most love to my outdoor yoga practice essentials. 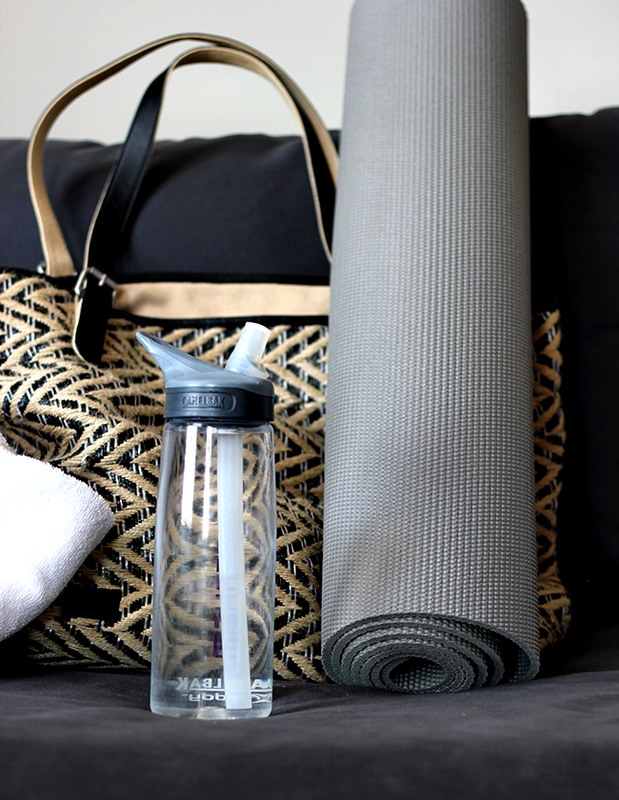 But I recently realized that I'd never shared one of the most basic items when it comes to yoga gear - the contents of my yoga bag. Now I'm admittedly not one of those ultra put together people who walks around in super stylish workout clothes carrying an expensive, top-of-the-line gym bag. 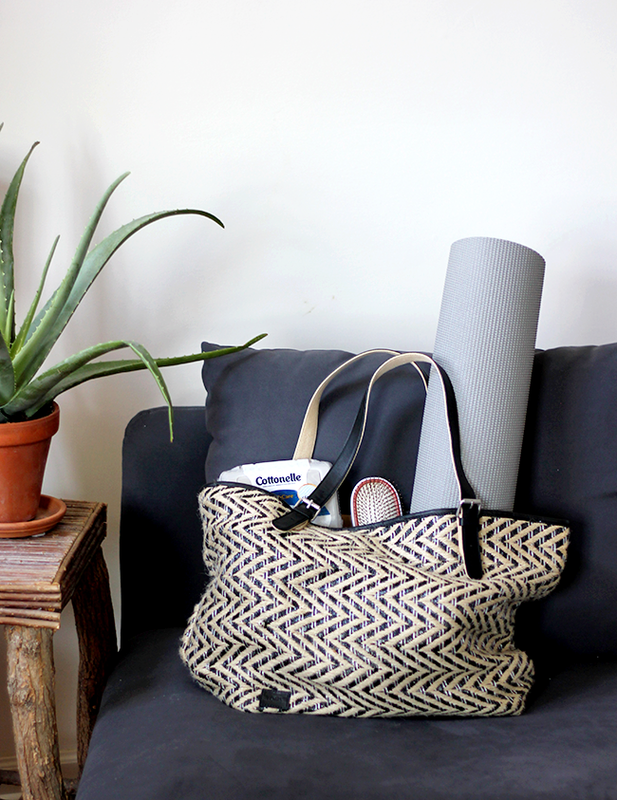 You can usually find me practicing in cheap black leggings and an old sports bra and/or oversized tee, and what I call my "yoga bag" is just a favorite tote filled with the things that I feel best contribute to my overall experience. I don't follow a lot of rules about what I should or shouldn't have in the bag. Through trial and error I've found that items that work best for me, and I hope by sharing them I'm able to inspire you to find those that work best for you as well. 1. A Well-Loved Yoga Mat. I mean, let's just get the obvious one out of the way, right? I've gone through many yoga mats over the years but this one is my favorite. I like the pale gray color, and it's an extra thick (5 mm) mat that I initially got for outdoor practice but now use indoor as well. Lots of places have yoga mats you can use, but there is something about having a well-loved one with me that helps me stay mindful during a class. 2. Extra Hair Ties. I am an expert at losing and/or breaking my hair ties. I like to keep some extras in my yoga bag as back up. Emi Jay makes some super cool wide ones and I love that they donate 20% to charity. 3. A Hairbrush and Dry Shampoo. 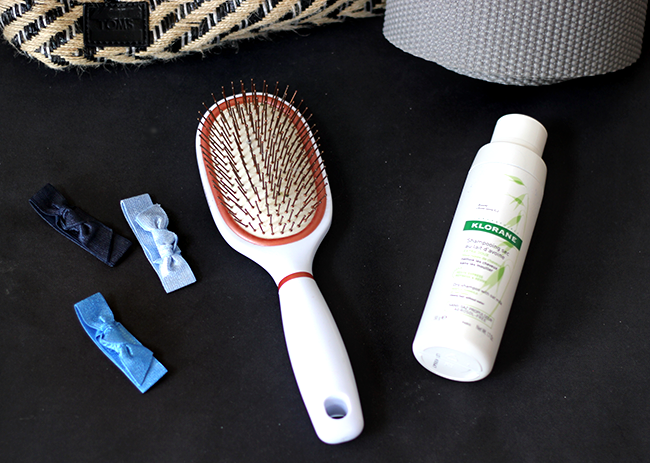 Especially if I have errands to run or need to take Essley to school or dance after I work out, brushing some dry shampoo through my (usually sweaty) hair is a necessary and easy fix. 4. Crystals. Hey, I never claimed to have lost the hippie spirit that ran through me in my early twenties, guys. Yoga is about more than just fitness to me. It's important to my practice to be mindful and have a good headspace when I'm doing yoga, and that means keeping objects that promote positive energy closely. I always carry at least one in my yoga bag (and in my purse, too). 5. A Reusable Water Bottle. I have had this one for years, and have never attended a yoga class or practiced in my living room without it since. 6. A Hand Towel. I don't usually practice hot yoga but there are times that even the gentlest of Hatha workouts make me sweat. I think constantly carrying around a barf cloth for my baby got me used to having a towel with me at all times, but honestly, it's a pretty handy thing to have on hand. Sometimes I use a fitness towel, but often I just grab a regular (and let's admit it, much softer) hand towel from my linen closet. 7. Cottonelle® with CleanRipple® Texture Flushable Cleansing Cloths. I've already been completely open with you guys about my uncanny ability to sweat during even the easiest of yoga practices (see "hand towel" and "hairbrush/dry shampoo" above), so I may as well come right out and share the fact that when I say sweat, I'm talking about sweat pretty much everywhere, bum area not excluded. 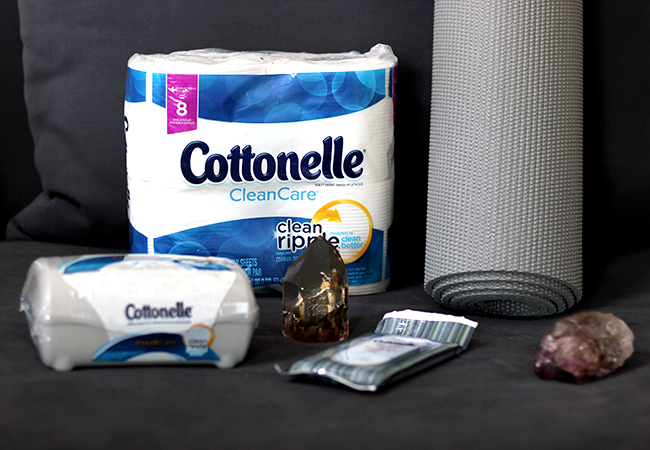 So I always have a pack of Cottonelle® with CleanRipple® Texture Flushable Cleansing Cloths in my yoga bag to help me feel my best during and after practice. Cottonelle® with CleanRipple® Texture is designed to clean better, so you're clean and confident enough to go commando. (Yep, commando. Because let's face it, underwear is the last thing you need standing in the way of you and nailing that inversion or setting a new personal record.) And Cottonelle® with CleanRipple® Texture toilet paper is equally awesome, so it's a must have for us at home too. 8. Essentials Oils. Essential oils are such a great way to really get into the whole mind/body/spirit aspect of yoga practice. Tea tree is great for feeling clean after a work out, and I love lavender for getting myself into a calm, focused head space before I start. 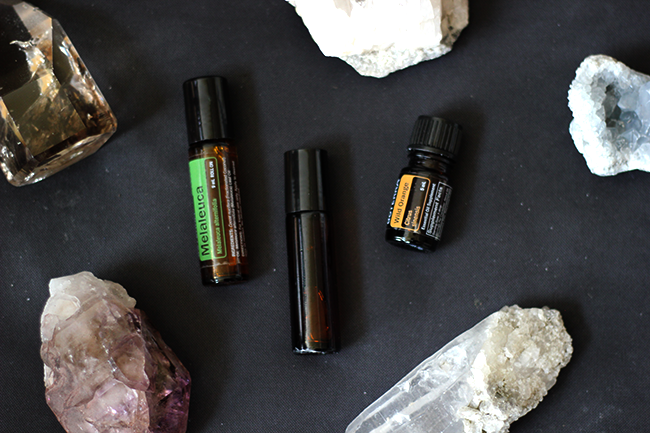 You can easily make a DIY yoga mat cleaner with essential oils too. 9. Homemade Trail Mix. 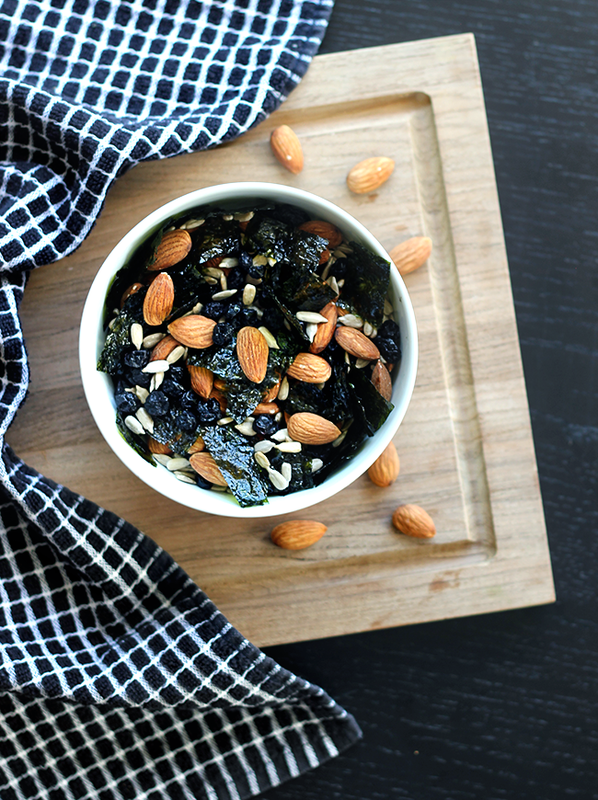 I throw in some raw almonds, raw sunflower seeds, dried fruit, and seaweed. I'm always hungry after yoga, without fail, and a couple of hand fulls of this keeps me sustained until my next meal. And now, onto the giveaway! 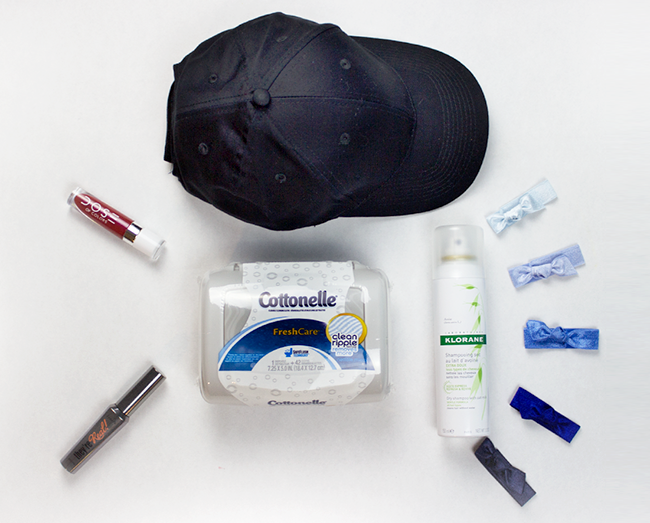 Enter below to win a Cottonelle® Fitness Must Haves Kit ($50 ARV) as seen in the image above. 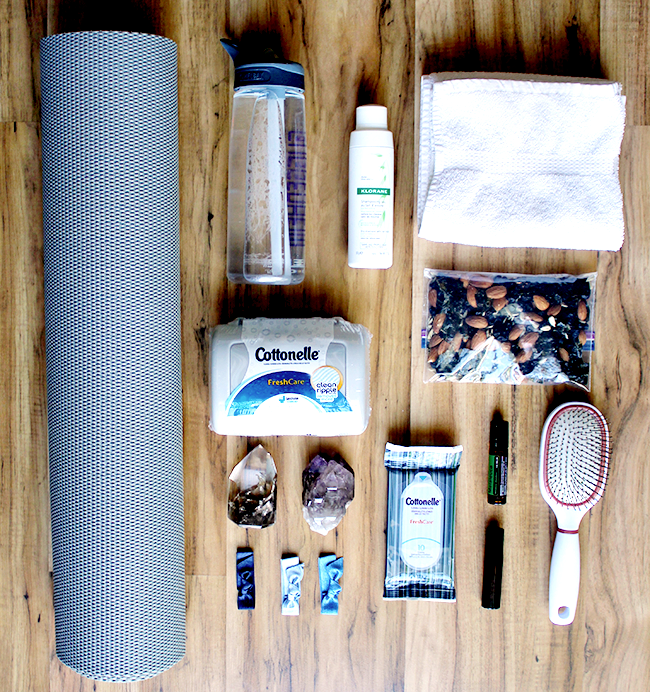 It contains a selection of fabulous yoga/fitness must haves - Cottonelle® with CleanRipple® Texture Flushable Cleansing Cloths (one of my yoga bag essentials! ), Benefit mascara, Dose of Colors lip gloss, Klorane dry shampoo (yet another of my yoga bag essentials! ), Emi Jay hair ties (yet another of my yoga bag favorites), and a plain black baseball cap. The Cottonelle® "Fitness Must Haves" Reader Giveaway runs through 11:59 PM on October 28, 2016. There will be 20 winners total from several blogs. Good luck! 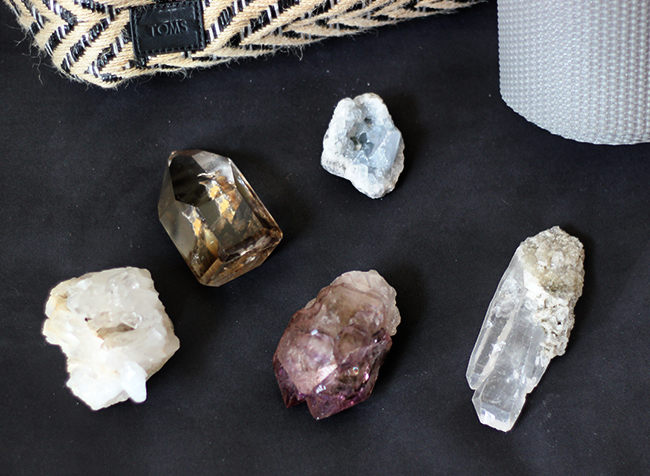 I carry essential oils in my yoga bag too and I like the crystal idea!! Love the crystal idea AND THAT BAG!!!!!! DROOL! !